York businessman Tom Wolf announced his candidacy for Governor Tuesday after a poll he commissioned showed a high number of undecideds in the Democratic primary. The survey, conducted by DC-based Greenberg Quinlan Rosner Research, showed former Congressman Joe Sestak in the lead with 21% of a Democratic primary. Congresswoman Allyson Schwartz was in second at 16% and Pa. Treasurer Rob McCord third at 7%. At 3%, Wolf was in fourth. But based on the 45% of respondents who were undecided and the additional 25% who chose a candidate but expressed only soft support the pollsters conclude that there’s room for Wolf. Wolf formally announced his bid on Tuesday and told supporters that he was planning to spend $10 million of personal funds in the primary. That number is a game changer. Schwartz and McCord have not declared their candidacies yet, but are expected to. Sestak, who ran statewide for U.S. Senate in 2010, has not given an indication whether he will run. The pollster surveyed 602 likely Democratic primary voters from March 2 – 7. The margin of error is plus or minus 4%. As with any internal poll, it should be taken with a grain of salt. Campaigns tend to release internal polls when they either bolster their own viability or diminish that of an opponent. In this case, it’s the former. They say Wolf’s numbers improved when respondents read positive bios on all the candidates. The polling memo does not include the language used in those bios, nor any cross tabulations. 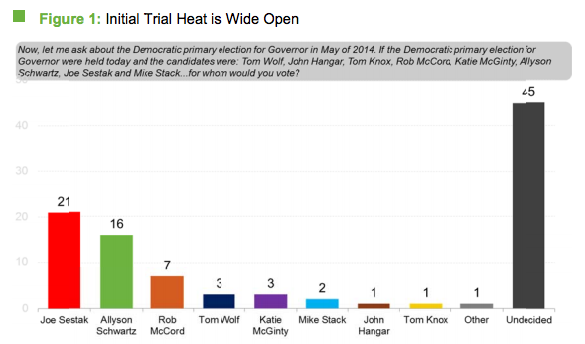 That said, the numbers reflect other polls and the conventional wisdom of the race: Sestak and Schwartz start out with an advantage but not a prohibitive one. That ten million can be wasted on over paid and underproducing consultants easily. I need to look into this guy more. If he is pumping $10 million of his own money into the Dem primary, he is a contender. Wolf maybe the dark horse who can win. It will take every single dollar of his $10 million to do it though. So, he better be prepared to spend. The more I think about it I think Sestak stays mum and allows his name to be tied to the Guv campaign but I really think he wants to Senate seat. After all, the Senate is more elite than PA Guv. I take it the post-long bio vote didn’t have Sestak as an option. That maybe the most tell tale sign he is not running. Their have been multiple polls which exclude his name. Any serious challenger would poll against him to see where they stand unless he doesn’t plan to run.